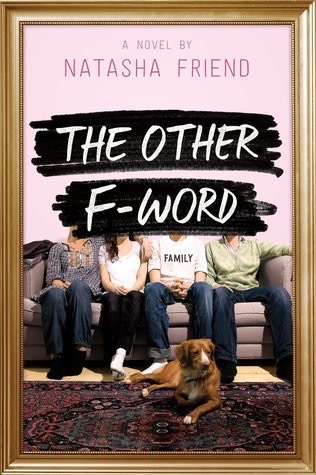 Natasha Friend’s The Other F Word is a funny and honest look at the mess that is family. I enjoyed it, even though it made me cry a teeny, tiny bit. I gave this book a four star rating. I enjoyed the dual narrative perspectives – it was a smart and interesting way to give two viewpoints about the topic, and the fact that it gave a male and a female perspective made this a book that I would hand to readers of both genders. The narrators are funny and embarrassed of their family and amazed by their family and pretty much feel like real teenagers. The decisions the characters face bring up a lot of emotions, and the book does a good job at portraying them honestly and in a way that allows readers to connect with them even if this is nothing like their own situation. I also appreciated the fact that it gave both of the main characters a journey that was meaningful. This really is a book about family, and it does highlight the fact that family can mean a lot of things. Themes of grief, independence, and belonging add a nice weight to the story. I’m adding it to my high school classroom library wishlist and recommending it my my school librarian. Language and situations are appropriate for grades 8+, but adult readers of YA can enjoy it as well.